The following statements were issued Feb. 25 by National Basketball Players Association representatives in opposition to the passing of the anti-union “budget repair bill” by the Wisconsin Assembly on Feb 24. Editor’s note: Sharon Black is an organizer with the National Bail Out the People Movement who has been at the State Capitol in Madison since day two of the occupation. She submitted the following report on the morning of Saturday, Feb. 26, prior to the huge demonstration of 100,000 workers that took place that afternoon in Wisconsin’s capital. Morning, Feb. 26 — The occupation is growing stronger every day. The big news on Feb. 25 was that 150 workers or so flew in from Los Angeles. Among them are bus drivers, teachers, nurses, hotel workers, longshoremen, electricians, construction workers, costume designers, utility workers, truck drivers, letter carriers, refinery workers, grocery store clerks, college faculty, and more. They had more people waiting who were ready to come to show solidarity with us here in Madison, with those inside and ringing the Capitol. The LA workers arrived in the Capitol area with tears in their eyes, proud and happy to be standing together with their sisters and brothers in Wisconsin. This growing strength is important for the struggle here. We got news yesterday that the governor had ordered the police to clear the Capitol on Sunday, Feb. 27, at 4 p.m. CST. In preparation they are trying to make life miserable for those of us in the Capitol, making lots of noise, locking the doors at 9 p.m., booming the loudspeakers all night long to deny sleep, and refusing to allow people to bring in sleeping bags and other bedding. Somehow bedding got in anyway, which is good because it is really cold here in Madison. Their pretext for clearing the building is that they have to clean the Capitol. Of course it is the workers who keep the Capitol clean — we don’t expect that the governor and the Republican legislators will get out their brooms and mops and vacuum cleaners, and as of yet we haven’t heard this is being assigned to the National Guard. Last night hundreds of people slept in at the Capitol. Many of us are determined to stick it out until the end. What is an interesting development is that there were even some police who slept in here with their fellow public employees, giving evidence of a surprising split within an arm of the state. It is likely to be the police who are called upon to eject those participating in the occupation. 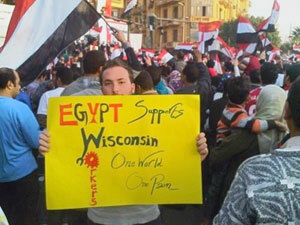 Some of the Egyptians who participated in the uprising there have been supportive of the workers’ struggle in Madison, Wis., as can be seen in the photo here. Other have donated funds to buy pizzas in Madison and have them sent to the workers and students at the state Capitol. Another example comes from CTUWS, an umbrella advocacy organization for independent unions in Egypt. The CTUWS suffered repeated harassment and attacks by the Mubarak regime and played a role in its overthrow. Kamal Abbas is general coordinator of the CTUWS and had been arrested and threatened numerous times by the Mubarak dictatorship. In a message to the people occupying the Capitol, Abbas said: “I speak to you from a place close to Tahrir Square in Cairo, heart of the Revolution in Egypt. Here in ‘Liberation Square’ many of our youth paid with their lives and blood in the struggle for our just rights. “We stand with you as you stood with us. No power can challenge the will of people who believe in their rights, raise their voices loud and clear, and struggle against exploitation. “No one believed our revolution could succeed against the strongest dictatorship in the region. Yet in 18 days the revolution achieved the victory of the people. When the working class of Egypt joined the revolution on Feb. 9, the dictatorship was doomed and victory became inevitable. “Victory always belongs to the people who stand firm and demand their just rights. Don’t waiver. Don’t give up on your rights. We and all the people of the world stand on your side and give you our full support. As our just struggle for freedom, democracy and justice succeeded, your struggle will succeed. “Today is the day of the American workers. We salute you! Victory belongs to all the people of the world, who are fighting against exploitation, and for their just rights.” Abbas saluted other peoples in the North African and West Asian region fighting to remove their rulers. The heroic worker and student takeover of the Wisconsin State Capitol in Madison, which is entering its second week, has evoked solidarity throughout many sectors of U.S. society; athletes are no exception. The Green Bay Packers, the only publicly owned team in the National Football Association and winners of Super Bowl XLV, are based in the working-class city of Green Bay, Wis. Past and present Packer members — Curtis Fuller, Chris Jackie, Charles Jordan, Bob Long, Steve Okoniewski, Brady Poppinga and Jason Spitz — issued the following solidarity statement on Feb. 15, the second day of the Wisconsin Capitol takeover. Following statement was issued on Feb. 15. The NFL Players Association will always support efforts protecting a worker’s right to join a union and collectively bargain. Today, the NFLPA stands in solidarity with its organized labor brothers and sisters in Wisconsin. We know that it is teamwork on and off the field that makes the Packers and Wisconsin great. As a publicly-owned team we wouldn’t have been able to win the Super Bowl without the support of our fans. The right to negotiate wages and benefits is a fundamental underpinning of our middle class. When workers join together it serves as a check on corporate power and helps ALL workers by raising community standards. Wisconsin’s long standing tradition of allowing public sector workers to have a voice on the job has worked for the state since the 1930s. It has created greater consistency in the relationship between labor and management and a shared approach to public work. These public workers are Wisconsin’s champions every single day and we urge the Governor and the State Legislature to not take away their rights. Feb. 21 — Inside the state Capitol building in Madison, Wis., the halls normally filled with politicians and corporate lobbyists are now occupied by thousands of people. Banners and posters with messages of solidarity and slogans denouncing Gov. Scott Walker’s attack on the public sector hang from every wall. Chants of “power to the people” and drumming fill the building from the early hours of the morning until late at night. The energy in the building is absolutely electric and all who are participating in the occupation and mass demonstrations are determined to carry the struggle forward until the anti-union bill is defeated. Young people and students are playing a decisive role in the historic struggle that is developing in Wisconsin. The occupation — which is entering its second week now — has been led by young workers, high school students, undergraduates and the graduate student unions. Students have developed food distribution centers, information points, medical teams and infrastructure. A people’s assembly was held to make collective decisions about how to keep and build the people’s control of the capitol building. The struggle has been a tremendous teacher, in helping to shape and guide the development of the occupation. Every day that the struggle moves forward, more and more young people are flooding Madison to stand with workers against the right wing’s attack on the public sector. This struggle has lit a fire in the hearts and minds of young people and awakened a spirit of resistance. So many young people that filled the halls of the Capitol, or have been marching in the streets shoulder to shoulder with workers, have remarked how this type of militant action has been long overdue and that they are determined to keep fighting until these right-wing attacks are defeated. Tens of thousands of students from all over Wisconsin, and indeed from all over the Midwest, have mobilized to participate in the many rallies and demonstrations that have been organized during the past week to help hold the occupation at the Capitol building. High school students in Madison organized walkouts and miles-long marches from their high schools to join their teachers down at the Capitol. Student organizations such as Students for a Democratic Society, Student Labor Action Coalition, Voces de la Frontera and the United Council, among others, have been helping to mobilize students to the Capitol and build solidarity for public sector workers. They’ve organized walkouts at a number of University of Wisconsin campuses, including more than 3,000 students at UW-Madison, organized by SDS. The graduate student unions maintain an organizing center in the Capitol building that runs around the clock, and student organizations help to staff and organize out of it. Students also helped to lead a demonstration against the Tea Party on Feb. 19 that drew out 100,000 trade unionists and students. 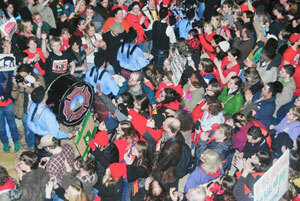 Feb. 19 – The people’s liberation of the state Capitol in Madison, Wis., is in full swing. “Now is the time. We can’t let this die because we are at ground zero and what happens here affects the rest of the world. We have to be strong. A united front,” said Mahlon Mitchell of the Professional Firefighters of Wisconsin at the massive afternoon rally at the state Capitol Feb. 19. Mitchell became the first African-American president of the PFW on Jan. 12. On Feb. 19 the biggest demonstration yet, with an estimated crowd of 100,000, filled the grounds outside the state Capitol and continued the sit-in. A massive roving picket line with all sectors of the working class — union and non-union workers, the unemployed, students, people of color, immigrants, and the lesbian, gay, bisexual, transgender, queer community — marched on the streets for the entire day accompanied by drumming, chanting, dancing and singing. The racist, anti-worker Tea Party crowd was entirely surrounded by those opposing Walker’s bill, which is an attack on the entire working class and oppressed internationally by the banks, corporations and the Pentagon. Some workers even waded into the Tea Party crowd and shouted at the main speakers. As has happened during the entire week, the Wisconsin State AFL-CIO, the Wisconsin Education Association Council, American Federation of Teacher-Wisconsin, American Federation of State, County and Municipal Employees, and other unions bused in thousands of members from across the state and beyond. Delegations of union members, students and other community members came from across the country and other locations such as Toronto, Ont. Emergency national demonstrations by the Bail Out the People Movement began Feb.18 at the Stock Exchange on Wall Street and continued nationwide. Solidarity demonstrations across the world began on Feb. 18 and continued on Feb.19. Both will continue until the anti-worker Walker bill is killed entirely. Walker and legislators for the so-called “budget repair bill” have been flooded with emails, phone calls and tweets. 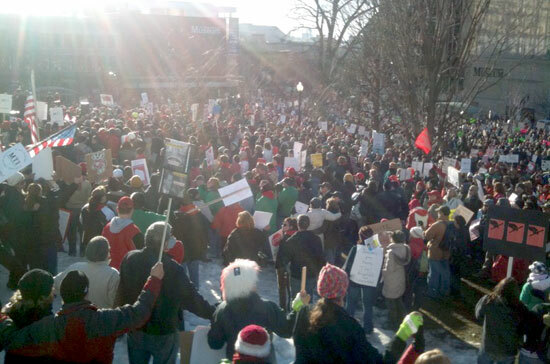 Thousands of union and non-union members and students have visited legislators’ offices. Virtually all the major unions have frequent updates on their websites. Facebook is ablaze with up-to-the-minute messages. Twitter updates are constant. Demonstrators utilize numerous other communication strategies, including a live stream from inside the Capitol. During the past week union members and their allies picketed Walker’s and other right-wing racist politicians’ homes, held protests throughout the state, sponsored candlelight vigils and more. These and many other actions are ongoing. People around the world, from California to Cairo, are supporting Wisconsin’s workers, who’ve seized their state Capitol building to fight union busting. 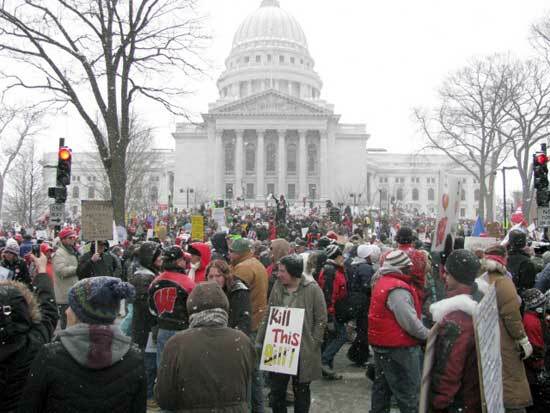 But this wasn’t the first time people seized the Capitol in Madison. On Sept. 29, 1969, Milwaukee mothers receiving public assistance, led by Father Jim Groppi and supported by 5,000 University of Wisconsin students, took over the Capitol. They held it for 11 hours and chased out the state legislators. This was a struggle against welfare cuts. Racist politicians wanted to cut out the winter clothing allowance so that poor people would be driven out of the state or freeze to death. Among the state assembly members chased out was future governor, Tommy Thompson, who took his revenge on poor people by abolishing welfare in the 1990s. Thompson and a majority of the state assembly had Groppi convicted of contempt and sentenced to jail without even allowing a legal defense. The U.S. Supreme Court later threw out Groppi’s conviction. Activists are proud that Wisconsin enacted the first workers compensation law a century ago. The state also passed the first unemployment insurance act in the 1930s. But as Lloyd Barbee, who led the state’s Civil Rights movement, said, “Wisconsin was progressive just for white people.” Barbee, who died in 2002, was one of the assembly members who supported the mothers on public assistance in 1969. One out of every twenty-five African Americans in Wisconsin is incarcerated. That’s four percent of all Black people in the state, from the infant in the incubator to the elder trying to blow out a hundred candles on a birthday cake. Twelve thousand African Americans are in Wisconsin prisons. Back in 1963, the state had fewer than 3,000 prisoners. The great migration of African Americans didn’t really reach Wisconsin until the 1950s. Even today just six percent of the state’s population is Black. Four percent are Latina/o. Yet factory after factory in Milwaukee and Racine, Wis., had large numbers of Black workers. Thousands of African Americans were employed in Milwaukee’s A.O. Smith plant, which made car frames for General Motors. Mexican workers filled the meatpacking plants in Milwaukee’s Menominee River valley. Four people were killed in the 1967 rebellion of Milwaukee’s Black community. Only the much larger Detroit and Newark uprisings that year had more casualties. Even before this revolt, Milwaukee was convulsed by daily demonstrations of the NAACP Youth Council, led by Father Groppi, demanding a law against housing discrimination. Every year, Vel Phillips—the first African American and first woman elected to the Milwaukee City Council—would introduce a fair housing law, only to have it voted down 18-1. Lloyd Barbee helped organize the 1965 boycott of the city’s segregated school system. Twenty-five thousand people marched down Wisconsin Avenue in downtown Milwaukee following Dr. King’s assassination on April 4, 1968. This march amounted to a Black general strike with close to one-fourth of the African Americans in the city participating in it. This writer remembers the riot police, armed with tear gas launchers, preventing people from crossing the Milwaukee River to the East Side, where the city’s financial district is located. During this period the Milwaukee chapter of the Black Panther Party grew rapidly. High school students were especially attracted to the Panthers. “The “Milwaukee Three” — Panther members Booker T. Collins Jr., Jesse Lee White and Earl W. Leverette — were framed up. Because of the relatively small size of Wisconsin’s Black community, the ruling class has used the state as a laboratory for reaction. Social services have been cut to the bone. Milwaukee is filled with charter schools. It was deindustrialization in Milwaukee that allowed capitalists to attack all workers. Plants like A.O. Smith and American Motors were torn down. White and African-American workers were thrown out of union strongholds in Milwaukee, but the Black working class was hurt much more. The result was a big weakening of the labor movement.